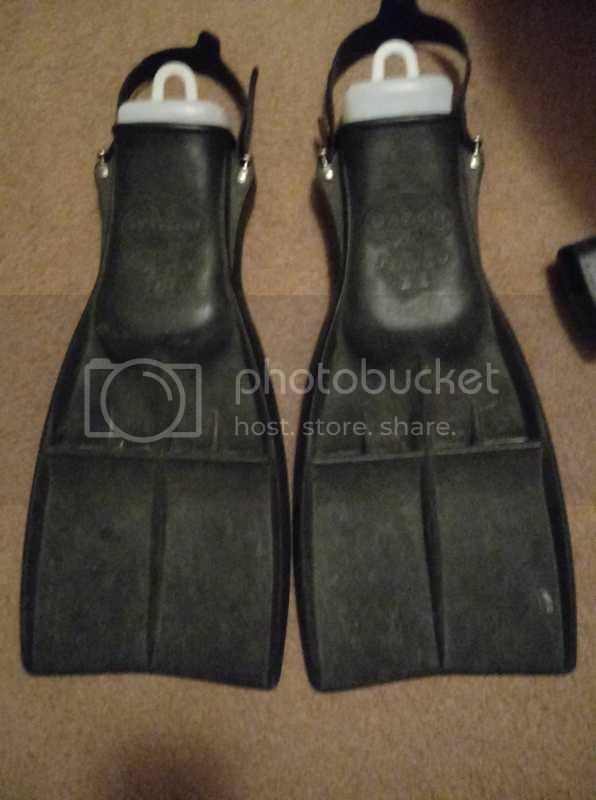 A local dive shop I haunt has a pair of Dacor Turbo II Fins sitting in the "old gear" pile. I'm seriously thinking of grabbing them the next time I'm there? Does anyone have info on these?, as in when they were being made? 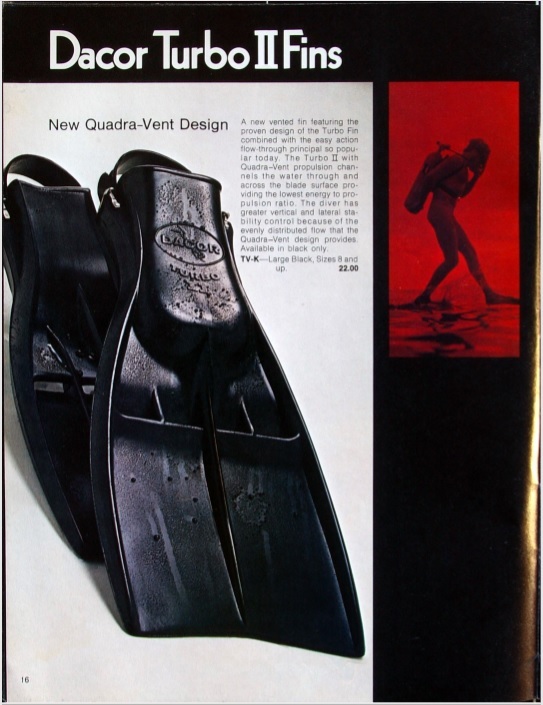 Another vintage scuba site has various catalogues for view, but the latest Dacor cat. I saw there was 1969. That year had the Turbo fin listed (NOT the Turbo II). I'm guessing the Dacor Turbo II Fin was a 1970's incarnation? Anyway, I was just wondering about them. I've got two pairs of Turbo II fins. A lot like the apeks RK3 that I also have. I wouldn't hesitate to use them, but don't spend too much on them. Look out for the straps too, they can be a bit worn. I think those can be replaced. I'll get some pictures up tomorrow. Both sets of fins have lasted a long time. Yes, the straps can be replaced, and I think they take the generic Jet Fin replacements which can be had cheap. As to how old these might be? I have a 1974 version of Dacor's "Diving For Fun" manual that I just looked through. Photos of the Turbo "Original" and Corda Fins, but no Turbo II Fins. Then again, this manual was originally published circa 1969 and the photos might not have been updated in the the 1974 printing? Come to think of it...I think there might be a pair of Dacor "Corda" fin lurking about there as well? Think I might suss out of they are in my size and think about those as well? What is it with Dacor and I here lately? Ha ha! The above page is from a 1974 Dacor catalogue, courtesy the CG-45.com website at www.cg-45.com/downloads/index.php?dir=Catalogs%2FDACOR%2F. No Dacor catalogues 1971-1973 on the site, so all I can say is that Dacor Turbo IIs were available in 1974 and still on offer in the 1980 Dacor catalogue. I agree with DRW, the Corda is a better fin for some situations. 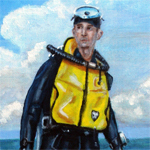 The Turbo II is good for boots, the Corda is better for warm water diving. I too have a set, Mark. I bust them out whenever I do a Nautilus dive! Good fins! Looking forward to diving with them this Summer. They are "different" I see a lot of Divers with ScubaPro "Jet" fins, or a clone, but never seen someone dive with Dacor fins.